This site helps go from a picture to one thousand words. Well, actually it provides images and you find the words to describe it from the list provides. A good way for the dyslexic to practice some key skills. 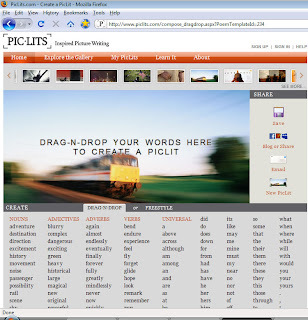 Thanks for the kudos with reference to "PicLits". Yes, it would work well for the dyslectic students but we are also getting feedback from ESL/ELL teachers who find it useful in working with hispanic students and visa versa. The bottom-line is that writng is a requisite for success and a complete sentence is essential to that success. Start simple and progress. Note that the Master it section under the "LEARN IT" icon is very sophisticated and advanced. The photos and words change daily. It is FREE. We hope to motivate people to express themselves in writing.